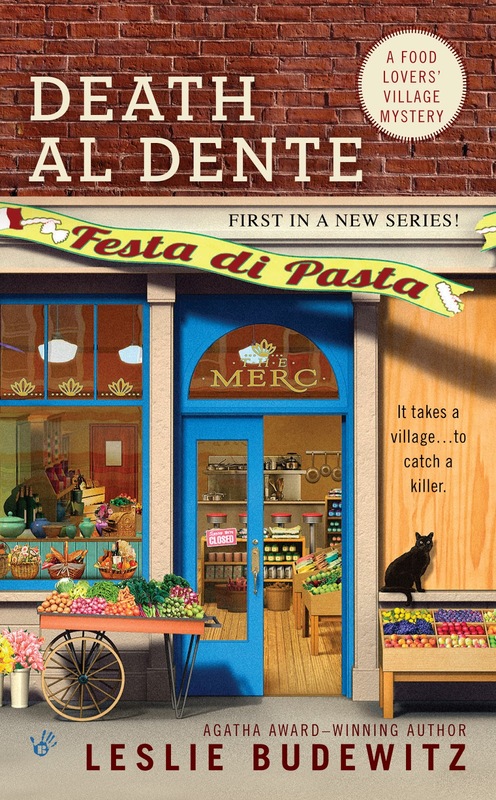 by Dean Vincent from Death al Dente, first in the Food Lovers' Village Mysteries, by Leslie Budewitz, coming August 6!!! Leave a comment for a chance to win a copy -- Elvis aka Dean will draw the winner Sunday evening! I’m all shook up! Finally, after years of working on my art, of stealing time from Linda and the girls and my chiropractic clinic to practice my moves, to get The Look, The Sound, I’m in! I’m going to Las Vegas to the Nevada College of Impressionism to study Elvisology. Just the short course – no need for a Ph.E., a doctorate in Elvisology. There are plenty of jobs for tribute artists. You don’t need a degree – you just need that special something. Oh, I know, there are people who don’t understand why a grown man wants to dress up as someone else and sing and dance. To shake, rattle, and roll. But it’s what I was born to do. Not listen to people complain about their stiff necks and sore backs. Hey, we’ve all got ‘em. Bone-cracking works, don’t get me wrong, and I’m grateful to have a job that helps people and lets me support my family and my art. But it’s time for me to do something for me. What I’m going to do about Linda and the girls, I haven’t decided yet. Linda, she loves me tender, but she can be the meanest girl in town. But what about Claudette Randall? I’d sure hate to see those blue eyes crying in the rain. I tell myself, don’t be cruel, to a heart that’s true. I’m doin’ the best I can. And that’s all we can ask, isn’t it? What do you do – just for yourself? Leave a comment to win a copy of Death al Dente -- Dean will draw a name Sunday evening! Sounds like a wonderful new series. Can't wait to check it out! What do I do...I read cozy mysteries, of course! Looking forward to trying this new series - thanks. Read! It's the best escape ever. I've been to Montana so I'll have to check this out. A note from Leslie: I'm in Seattle this weekend -- Remember Elvis at the World's Fair? Hokey -- I mean, hunky -- 1962 movie with lots of great shots of Elvis and the Space Needle! Anyway, I'm here celebrating the release of Death al Dente, with a group discussion on mysteries at the Seattle Public Library, and one on getting mysteries published at the Pac NW Writers Assn conference. And today, at noon, I'll be signing at the Seattle Mystery Bookshop. I'm also researching my second series, set in Seattle. So glad to know Elvis is alive and well -- in your hearts! A new series with an Elvis theme. Who could ask for any thing better?. Looking forward to reading this. What do I do for myself? I color my hair to cover the grey---and I read cozy mysteries. Thank you for starting a fun series. I am eager to get started on the adventure. I love Elvis, listen to his music all the time. I'm looking forward to reading the book. I will love to try this new series. Thank you for the chance to win it. What fun! I do lot of things for myself, one of the joys of living alone I guess. One thing is that I still get stuffed animals. Nothing better than a furry friend-I have live ones as well, but the plushies are good too! Pedicures, stuffed animals, Elvis, and cozy mysteries -- what could be better??? Thanks so much for all the comments! Check the sidebar for the winner, to be announced shortly. What I do for myself is to paint wine bottles that I put mini lights in and people use them for mood lighting/night lights/ end table lights, etc. Most are given as gifts and I donate others to various charity fund raisers. I have sold a few, but cannot get enough done to set up a big enough sale. But it is something just for me to enjoy and relax with. I also meant to say that this new book, Death Al Dente sounds sooooo good. Looking forward to reading it and would love to win it, of course. Ooh, those wine bottle lights sound super-cute! Not only would I love one, I'm sure they'd be popular sellers at Snowberry, my sister Chiara's art gallery! Mr. Sandburg has dipped his paw into the fishbowl of names and chosen --- Sue Farrell! Congratulations, Sue -- we hope you enjoy the fictional trip to Montana!